The staff were friendly and helpful, they made us feel welcome and were responsive to our needs, wonderful holiday. When would you like to stay at YHA Eyam? The hostel is well-used by school groups, walking groups, families and individuals who come to enjoy the beautiful Derbyshire countryside and discover more about the tragic story of the villagers of Eyam who sacrificed themselves to the Plague in the 17th century. 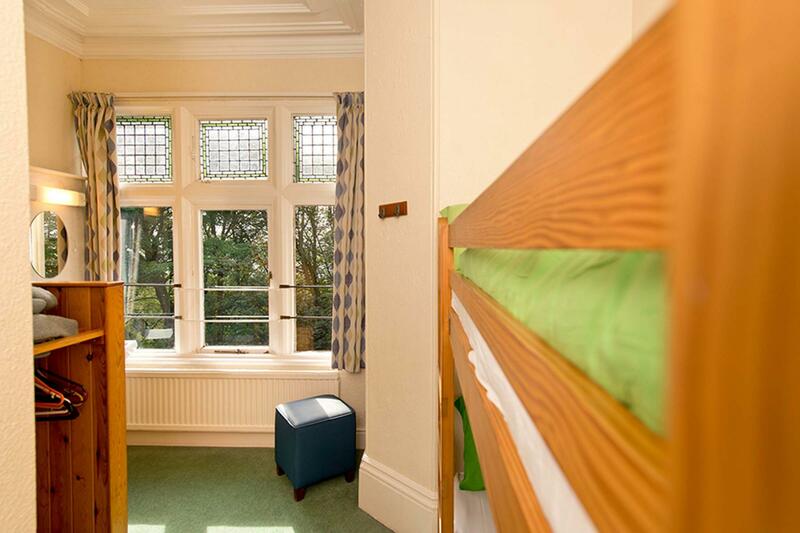 This 60 bed Youth Hostel has ten rooms in the Main House ranging in size from two to eight beds (all bunk-beds) and four rooms in the Coach House (again bunk-beds). The dining rooms can seat up to 36 and 24 people respectively. We have a variety of board games, lego, a train set, puzzles and books etc, for children and a selection of books and magazines for adults. The games room has a pool table and vending machines for drinks and snacks. The two function rooms are ideal for groups who wish to celebrate special occasions – birthdays, anniversaries and special occasions and can also be booked by school groups as classrooms. They can seat up to 36 and 24. The self-catering facilities are only suitable for families and individuals. The facilities are limited and not located within the main hostel, so it might be advisable to book meals with us. There is a huge variety of walks starting from the hostel doorstep. 7 miles Take a trip to Bakewell and discover this charming Derbyshire Dales town. Open every day? : No - YHA Eyam is closed on Sundays from November until February. Beds and rooms become available to book three months in advance so see the website to check availability. Towels and toiletries: Towels and toiletries are not supplied but are available to hire or buy from reception. Bedding is supplied. Pets: Pets are not permitted at YHA Eyam. Assistance dogs are welcome. Parking: Parking is available in a car park at the bottom of our driveway. You are welcome to proceed up the drive in order to unload your luggage and then return your vehicle to the car-park afterwards. YHA Eyam is within easy access of sites of interest for a range of subjects including, PE, geography excursions and history trips. With 60 beds, group catering available, classroom facilities and a games room, YHA Eyam has everything a school trip needs. Over a hundred years ago, in the Golden Jubilee year of Queen Victoria’s reign, Beech Hurst was built as a Victorian folly. Massive iron gates were constructed to guard the entrance to the rough holly-lined drive. The house with its imposing tower was built into the steep hillside and surrounded by beech trees which helped to prevent the shale from shifting and provided some degree of protection from the elements. The first owner was William Nixon (Old Nick as he was often called), a magistrate at Bakewell Assizes whose fines were so heavy he had a bell installed in the tower to summon his protectors should any of his former “clients” come to visit. After 50 years the house was found to be ivy-clad and in need of repairs – the bell lay silent, bats filled the tower and the grounds were unkempt. The house was owned by a Captain Bird and then by Frank Robinson – the owner of the Glebe Mine – who installed mains water. The next owners – the Hickmans - installed heating and restored the gardens to their former glory. The house was bought by YHA in the early 1970s and the hostel opened in 1972. Rob and Terri have run the youth hostel for 24 years (! ), bringing up their three children in the village. They previously ran YHA Crowden together (sadly no longer a youth hostel) and before that they were assistants at YHA Hartington and YHA Ilam Hall. Manager recommends: Take the walking trail around the village to discover the tragic history of Eyam - an interesting history lesson for a family weekend break. YHA Eyam is an ideal location for cheap breaks and as the hostel sits on the boundary of the White and Dark Peak there’s lots of excellent routes for a walking holiday.